RECEPTION HALL 18′ 8" x 6′ 8" (5.71m x 2.04m) With radiator, large walk-in cloaks with storage cupboards. LOUNGE 14′ 1" x 11′ 11" (4.30m x 3.64m) With a real flame coal effect fitted gas fire in a Victorian style feature fireplace with timber surround and over mantel, bay window overlooking the front of the property, two further windows to the side elevation, dimmer light switch, radiator and power points. SECOND SITTING ROOM 15′ 1" x 13′ 11" (4.61m x 4.25m) With a bay window enjoying far reaching views looking out over the St Melyd Golf Course with views to the picturesque Bishops Wood, a recessed fireplace housing an electric stove type convector fire, radiator, dimmer light switch and power points. KITCHEN/DINER 22′ 10" x 11′ 10" (6.96m x 3.61m) With a full range of high gloss cream units incorporating base cupboards and fitted wall cupboards with under lighting, a one and a quarter stainless steel top sink unit, peninsular breakfast bar, integrated ‘Electrolux’ self cleaning oven and ceramic hob with extractor hood, plumbing for dishwasher, integrated fridge freezer, built-in microwave, power points, tiled splash back, useful under stairs storage cupboard, ‘French’ doors lead onto the side garden, window with an outlook over the front, radiator, inset spotlighting, tiled flooring to the kitchen area. UTILITY AREA 11′ 4" x 3′ 10" (3.46m x 1.17m) With plumbing for automatic washing machine, matching fitted cupboards, radiator, door giving access to the garden. CLOAKROOM 3′ 10" x 2′ 7" (1.17m x 0.81m) With low flush w.c., wash hand basin and tiled floor. MASTER BEDROOM 15′ 6" x 11′ 11" (4.74m x 3.65m) With a full range of fitted wardrobes, radiator, power points and bay window enjoying far reaching views over the Golf Course looking towards Bishops Wood. ENSUITE 5′ 2" x 5′ 1" (1.59m x 1.57m) With a three piece suite in white with pedestal wash hand basin, siphonic low flush w.c., shower cubicle, heated towel rail and part tiled walls. BEDROOM TWO 14′ 1" x 12′ 5" (4.31m x 3.81m) With a bay window over looking the golf course with coastal views, radiator and power points. BEDROOM THREE 11′ 10" x 11′ 3" (3.62m x 3.44m) With radiator, power points and an outlook over the front looking towards the coast and the Irish sea. BEDROOM FOUR 8′ 9" x 8′ 5" (2.67m x 2.58m) Presently used as a Study with radiator, power points and views towards the sea. 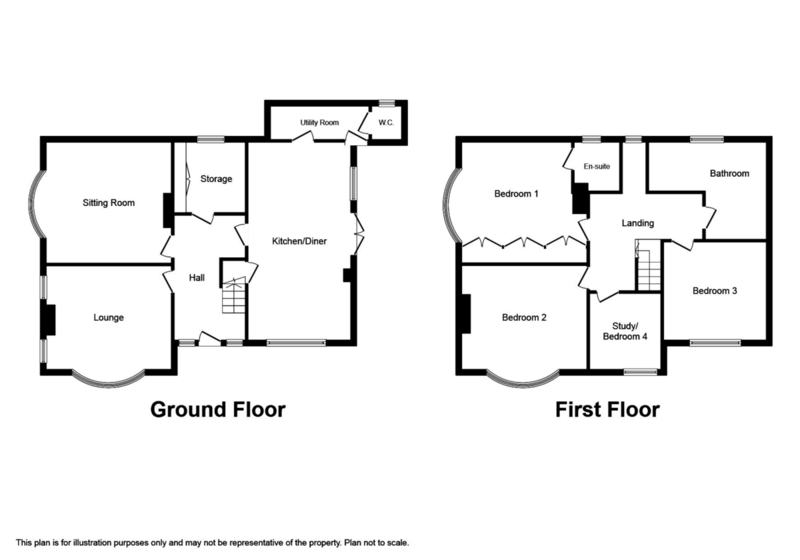 BATHROOM 11′ 10" x 8′ 3" (3.63m x 2.54m) Having a five piece suite in white with a large tub bath, bidet, close coupled low flush w.c., wash basin and large walk-in shower, part tiled walls, radiator, inset spotlighting and heated towel rail. OUTSIDE The property occupies an attractive corner position with manicured lawned gardens, fencing affording part seclusion, double drive wtih ample off street parking. To the side of the property there is a raised paved patio and timber constructed GARDEN STORE, low maintenance gravelled areas, outside lighting, water tap and power sockets, pedestrian gate lading to the front driveway. SERVICES Mains electric, gas, water and drainage are believed available or connected to the property. All services and appliances are not tested by the Selling Agent. DIRECTIONS From the Prestatyn office turn left onto Meliden Road and at the roundabout continue straight across and proceed into the village of Meliden, turn left onto Ffordd Tanrallt and second left onto Bryn Llys where the property will be found at the far end on the right hand side by way of a ‘For Sale’ sign.